Save My Live – Basic, Advanced, And Ultra-Advanced Emergency Fire-Starting TOTAL Package! Save My Life – Basic, Advanced, And Ultra-Advanced Emergency Fire-Starting TOTAL Package! This Package – Save My Life – Basic, Advanced, And Ultra-Advanced Emergency Fire-Starting TOTAL Package is 24-years of experiences, “intensive research”, discoveries, and INVENTIONS when it comes to EMERGENCY FIRE-STARTING. This Basic, Advanced, And Ultra-Advanced Emergency Fire-Starting TOTAL Package book (628-pages, 146,876 word count) includes basic-fire-starting (Boy Scout level), advanced fire-starting, and ultra-advanced fire-starting that is far far far easier than rubbing 02 frickn’ sticks together. YOU don’t have time to be B.S.ing around – YOU need a FIRE now – right frickn’ now or you’re all DEAD! DVD Videos (16 DVD Videos – 19+ hours) that is far far far easier than rubbing 02 frickn’ sticks together. YOU don’t have time to be B.S.ing around – YOU need a FIRE now – right frickn’ now or you’re all DEAD! DVD Videos (DVD Videos – 10+ hours). —NOTE: These Survival Paperback Book dimensions are 08-inches by 11-inches. See www.survivalexpertbooks.com for details for each book. We are all creatures of comfort and we are especially fragile creatures of comfort. And to protect, comfort and support our fragile bodies is one of the greatest inventions of all time – FIRE! When you go out in the vast beauty of Mother Nature to hunt, camp, hike, fish, explore, and even on combat patrols (military)… the many wraths of Mother Nature and all She possesses is absolutely unforgiving to the ignorant and disrespectful. And one of the sure KILLER WRATHS of Mother Nature and all She possesses are killer freezing temperatures. Mother Nature and all She possesses is absolutely unforgiving and doesn’t care if you’re a law-abiding, turn the other cheek, pet-loving person or a downright piece of sh!+ scumbag – either way you’re at the mercy of yourself! Only YOU – ONLY YOU with your own immediate emergency actions can save you and those under your care, to survive to see the next day. No wishful thinking here, no ‘THE SECRET’ – wishing crap here. Your next immediate emergency actions will decide your own fate. It’s up to you and only you. You are at the mercy of yourself. You and those that are depending on you are another set of ‘dead statistics’ real quick or you are the HERO and everyone is alive cause you started an emergency fire using a coffee drink flavor supplement! You started an emergency life-saving fire where 99.999% of most folks – even those so-called ‘survival experts’ will surely fail and die in place along with all those innocent people that depended and trusted him / her with their very lives. Of the 8 Elements of Survival (Fire, Water, Shelter, First-Aid, Signal, Food, Weapons, and Navigation), in my humble & experienced opinion, pound for pound – FIRE is the most important in most survival situations. FIRE gives you that sense of security at day and especially at night. 99% of most critters want nothing to do with FIRE. FIRE is a great beacon for rescuers and most important, FIRE keeps killer hypothermia from taking another life – your life and the lives that depend on YOU. And there’s also a laundry list of benefits from FIRE. This Save My Life – Basic, Advanced, And Ultra-Advanced Emergency Fire-Starting TOTAL Package covers so many ways to start and sustain emergency fires, if you tried to copy & employ all of my applications, it would take you several months to years to try them all out at your leisure. This Basic, Advanced, And Ultra-Advanced Emergency Fire-Starting TOTAL Package book covers emergency fire-starting that WORKS. NO FRICKN’ RUBBING 02 STICKS TOGETHER. NO, no frickn’ rubbing 02 sticks together in this Survival Book. I personally have NEVER and Never will teach those prehistoric fire-starting methods. Why? They are too difficult to get to work. And will NEVER NEVER NEVER NEVER NEVER NEVER – one more time – NEVER work when you’re truly hypothermic (keep reading). You’ll read how the REAL SURVIVORS throughout history and throughout the world started emergency fires. And you’ll read how I start emergency fires. I teach basic, advanced, and ultra-advanced emergency fire-starting. Most of the advanced and especially the ultra-advanced fire-starting applications ARE MY OWN COPYRIGHTED INVENTIONS! Hey, if you get in trouble and everybody is starting to go hypothermic, YOU need an emergency fire NOW, RIGHT NOW. Not 40-minutes or 04-hours from now trying to rub 02 frickn’ sticks together – YOU NEED A LIFE-SAVING EMERGENCY FIRE RIGHT NOW! Have YOU ever been truly hypothermic? Have you ever been truly hypothermic when your hands & fingers will not work, they feel like wood, (you can’t even use a lighter or matches if you had them), you can’t even tie your shoe laces – your hands & fingers will not work. You and everyone with you are shivering non-stop, and cussing up a storm too or trying to cuss! You’re so cold your mental faculties are going out the window too. Simply talking and trying to put words together is difficult. I’m telling you, I’ve been severely hypothermic several times (military) and only my extreme stubbornness kept me alive. Back then I too couldn’t start a life-saving fire if my own life depended on it. And even if I could, the military training prevented it, cause it’s violating Noise & Light Discipline. In 1991, I started putting my own Survival Programs together. And since the late 1990s, I’ve been challenging anyone to come forward and show me a better survival program, better survival course, better survival books,.. (military or civilian). No one has yet to come forward. And my Survival Programs have progressed and improved from 1991 to the present day. MOST IMPORTANT NOTE: I’m the ONLY Survival Instructor on Earth that teaches these emergency advanced and ultra-advanced fire-starting applications. Why? Cause I invented most of them! Besides, rubbing 02 sticks together is not an option when your life and the lives who depend on YOU are on the line! Get the Save My Life – Basic, Advanced And Ultra-Advanced Emergency Fire-Starting TOTAL Package. by CLICKING THIS LINK OR THE LINK BELOW. And odds are you have some of these items on you when you’re outdoors but have NO IDEA how to employ them to get an emergency fire started. Don’t feel bad, NOBODY (except my subscribers) can start fires with these DOZENS of personal care products, first-aid products, breath enhancement products, and drink enhancement products. Why? Like I said before – I teach basic, advanced, and ultra-advanced emergency fire-starting. Most of the advanced and especially the ultra-advanced fire-starting applications ARE MY OWN COPYRIGHTED INVENTIONS! I know YOU WANT TO BE READY ANYTIME ANYWHERE – so get your own Save My Life – Basic, Advanced, And Ultra-Advanced Emergency Fire-Starting TOTAL Package and You’ll Be More Ready Anytime Anywhere than 99.99999% of most folks walking this Earth. YES, you’ll be more Ready Anytime Anywhere than even those pretty boys on television teaching survival. None of them can match my military credentials, especially this book and my Survival Programs – none of them. See my military credentials at “About The Author” in this website. Thank You For Your Wise Interest In My Survival Book. PS I GUARANTEE YOU – once you go over all the reading material and view all the DVD videos in the Save My Life – Basic, Advanced, And Ultra-Advanced Emergency Fire-Starting TOTAL Package – just the first time (multiple reads are advisable), you will know more REAL EMERGENCY FIRE-STARTING / FIRE SUSTAINING applications than ALL them TV survivor types, military SERE Instructors, and civilian survival teachers put together. Hey, I’m a qualified US Army SERE Instructor and all them military SERE instructors and those entertainers on television shows teach that same ol’ “rubbing 02 frickn’ sticks together” stuff. Not here. When YOU need an emergency fire, there’s NO B.S.ing around – NO “rubbing 02 frickn’ sticks together” in the Save My Life – Basic, Advanced, And Ultra-Advanced Emergency Fire-Starting TOTAL Package. 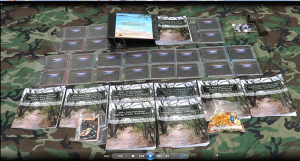 PPS If you would like a Special Report and DVD Video for the Save My Life – Basic, Advanced, And Ultra-Advanced Emergency Fire-Starting TOTAL Package drop me a postal note with $9 to cover postage & handling. I’ll send it to you within 24-hours. See mailing address below. IMPORTANT NOTE: Most folks just don’t believe me. They think I’m lying to them. Most folks don’t believe me when I tell them that I can teach them how to start emergency fires using shampoo, toothpastes, mouthwashes, salves, skin creams, medicines, drink enhancement products,… So check-out the videos above.